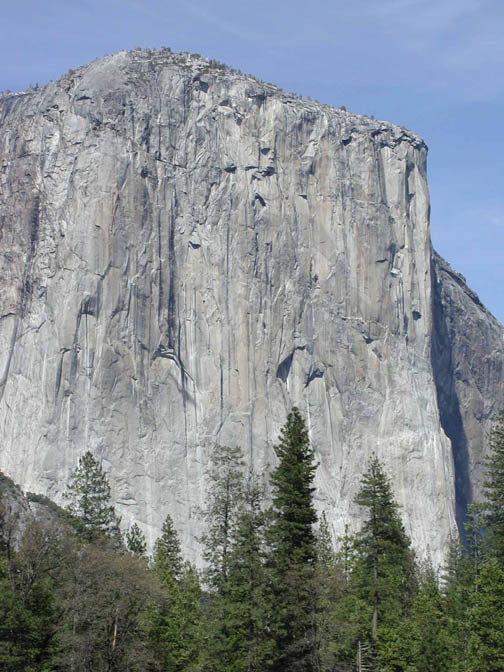 "Long, sustained and flawless, the Nose may be the best rock climb in the world; it is certainly the best known. On paper, at 5.9 C1, The Nose sounds easy. It’s not. With over 31 pitches of steep, exposed and strenuous climbing, The Nose is an immense physical and psychological drain. Extensive climbing experience on long routes is mandatory. The failure rate is high (David's note: about 50% of the climbers with the hutzpah to try, fail.) That said, anyone who is deeply committed to training for this climb can do it." For a closer view, click here. To start the climb, click How it all began.